There are many ways to get into the restaurant business. Some go through cooking school and become classical trained. Some are born into families with talented home cooks and years of observation. One thing is true to be a restauranteur, you have to be dedicated. I met Jaime and Billy at their restaurant, Cuba 312, located in Chicago's Roscoe Village. It felt like home. It felt like the kind of place you could come to day after day. You feel the love in the people and it is carried into the food. It is definitely a family restaurant specializing in Cuban fusion. They even had a selection of tropical mocktails for me to choose from. There are no rules at Cuba 312. The cuisine is based on Billy's Cuban heritage, but adds in cooking techniques and spices from Southern African American to Asian cuisine. Have you ever had Cuban Nachos? This comfort food is playful and tasty. 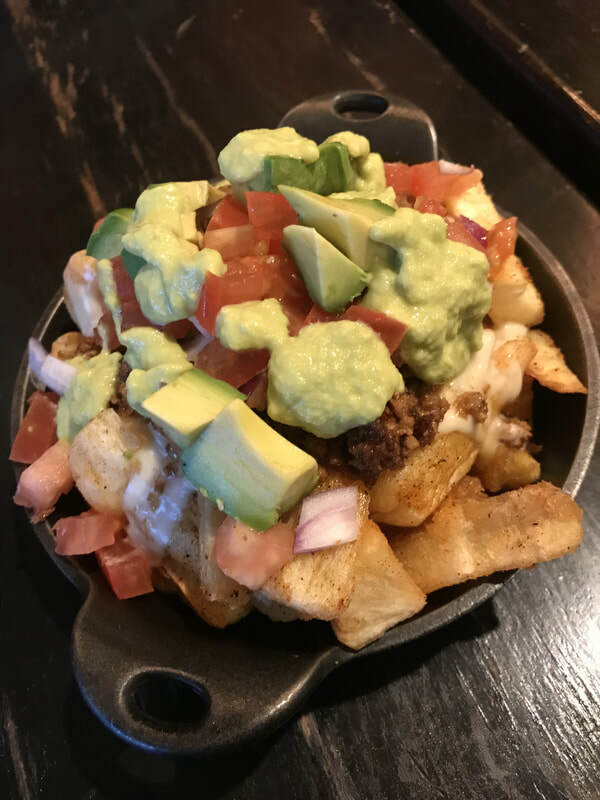 Using the crisped Yuca as a base is a unique substitute for tortilla chips. It is topped with a Piccadillo (spiced ground beef with tomatoes) and a jalapeño drizzle. Just enough spiciness to be flavorful. 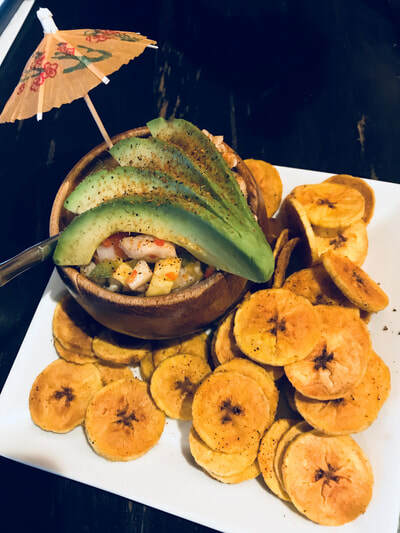 I love a good ceviche and have featured them on my Instagram before. Their's is a classic presentation with strong citrus notes paired with sweet mango. The type of fish depends on the season as freshness is most important per Jaime. This time they included shrimp and whitefish. I loved the accompanying plantain chips that were seasoned just perfectly. Next, I tried Billy's favorite, Chuleta Cubana. 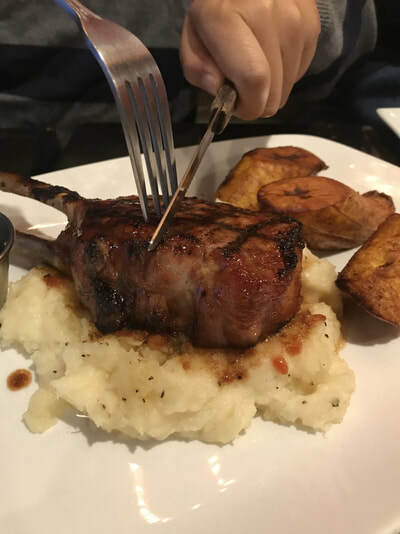 This is a succulent pork chop that is marinated in a classic Cuban Sofrito. They top it with a guava glaze and grilled and serve it over a garlic Yuca mash and with sweet plantains (Maduros). The mash is amazing! I probably could have eaten a plate of that. There is a significant Asian population in Cuba which influences classic Cuban dishes. The Mar y Tierra (surf and turf), a fusion dish pairs these flavors seamlessly. It is presented as a tower of yumminess. 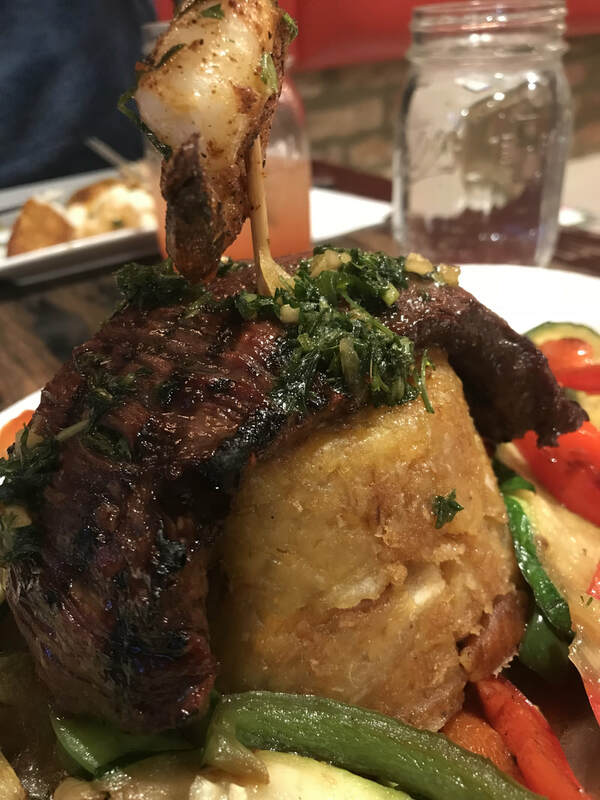 I love a good Mofongo and this one had all of the traditional flavors. Shrimp was sweet and smoky. The flank steak was marinated in teriyaki and grilled to perfection. Go to Cuba 312 and order that Coconut Lemonade mocktail. You'll thank me.